Bart O’Reilly says the toughest thing about being an artist isn’t making the art, it’s finding a way to get other people to see it. Gallery space is limited, museum space even more so. Having had some success with his own work, O’Reilly is eager to help fellow artists who are “under-represented,” in both the literal sense of lacking gallery representation and the broader sense of demographic groups whose work is less likely to receive mainstream attention. That includes developmentally disabled artists, a group O’Reilly has long taken an interest in. Working with disabled people at the Providence Center in Anne Arundel County, where he curated shows of their work, O’Reilly says he often encountered people who immersed themselves in their art. Some of the center’s clients used painting as a way to work through their problems, like a man who made comic books featuring a version of himself. O’Reilly now volunteers at Make Studio in Baltimore and serves on the advisory board of the organization, whose mission is to provide arts programming, “including sales and exhibition opportunities,” to adults with disabilities. His current goal is to form a collective bringing together disabled and non-disabled artists based in the Highlandtown Arts District, and to put their work in front of the public. Another idea O’Reilly is experimenting with is to turn the art gallery experience inside-out – instead of bringing the public in, bringing the art out to where people already are by projecting it through the window of a building on Eastern Avenue. O’Reilly, originally from Dublin, Ireland, lives in White Marsh with his wife, an art teacher, and their two sons. 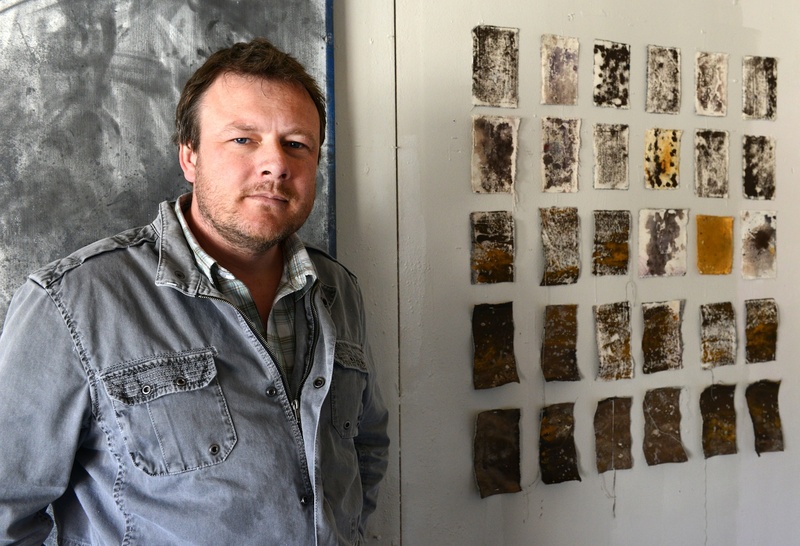 He received a BFA in painting from Ireland’s National College of Art and Design, and was still primarily a painter when he moved to the U.S. about a decade ago. But while pursuing an MFA at the Maryland Institute College of Art, he became interested in video. His thesis at MICA involved video projections of his paintings, and this medium forms the basis of his City Project(ions) concept. For the collective’s initial effort, O’Reilly plans to bring together five artists – at least one from Make Studio – each utilizing his or her own unique workspace. The project will use video to record each artist’s progress, including documentary-style interviews, and weave the five works together into a single video-projection piece for a public screening and reception. O’Reilly, 38, who has taught art at the community college level, plans to offer guidance and advice to the collective members but insists that “the ideas and artwork will all come from the individual artist,” and he wants people from all over Baltimore, including its most disadvantaged neighborhoods, to feel a connection to the city’s arts scene. The way to do that, he believes, is by offering under-represented artists advice, encouragement, and opportunities to show their work. “I don’t want a bunch of people who’ve already shown their work in New York City – I don’t think they need it,” O’Reilly says.